Yup, FLOW's already gone LTE-A in Montego Bay since May... they've also rolled it out it even more sites in Montego Bay. They'll also be widening the network bandwidth there to 20x20 on Band 2 after going live in Kingston with a simultaneous shutdown of 1900 MHz GSM. Given their current specturm holdings, there's no surprise here. Digicel's network will peak at 150 Mbit/s and FLOW's will peak at 225 Mbit/s now and 300 Mbit/s perhaps between end of year and Q2 2019. That's the fastest Digicels LTE can go with their current spectrum holding?. If Digicel added 4x4 MIMO and 256QAM, what theoretical speeds would we see?. I think Digicel should shut down their 2G network on band 3 1800Mhz. And build a stand alone 20Mhz Band 3 LTE Network, to complement what they have now. Little to no phones could support that. It has to be North American spec network rudiments. Further, 4x4 MIMO doesn’t work on 700 MHz. Again, FLOW did their homework. What they need to work on coverage infill and deeper network penetration. They’ve got the speed department on lock and will continue to for the foreseeable future in my estimation. Digicel has a slice of AWS 1 Band 4, couldn't 4x4 MIMO work on their band 4?. Digicel is so secretive about their network specifications. I pick up a 1900Mhz 3G layer for them sometimes, if they could reform that to LTE and deploy it, then that would help. It really wouldn't. 3CA is a Cat 9 LTE spec. Most people only have Cat 4. which does 10x10 MHz CA of 2 bands. OK, if you can though. Please put in a word to Flow about their not so stellar coverage in deep rural Jamaica. They have a lot of work to do there, and Im hoping the could enter some agreement with Digicel or Phoenix tower to share towers for coverage. Not sure if anyone else saw this. But guess they silently confirm that their WiMAX service is being terminated. Not sure why the image isn't showing. However this is the link below to their page. Last edited by Dre'; Oct 30, 2018 at 04:54 PM. The 3 C's in life: Choice, Chance, Change. You must make the Choice, to take the Chance, if you want anything in life to Change. Have you all seen Digicel's recent noisemaking about being the "largest LTE network in the English Speaking Caribbean"?. They claim 65% population coverage and the fastest data speeds on the island. While I'd leave them to their usual antics but I have to comment. The facts are simply not in their favor. 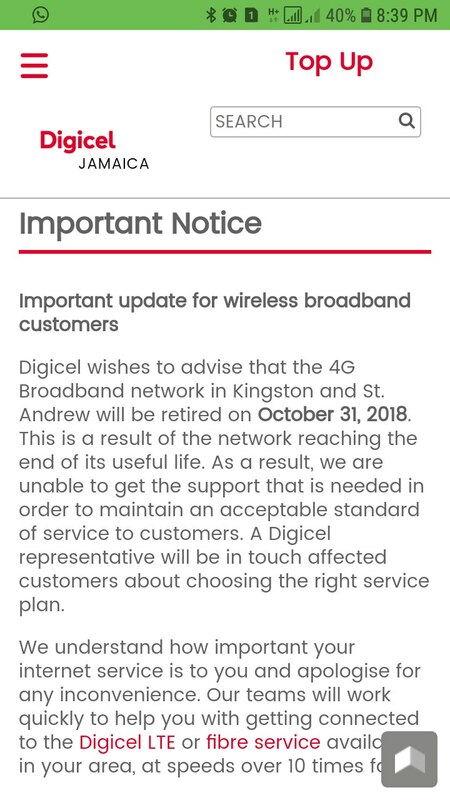 Their smaller player had 73% population coverage at November's end with most places getting access to not just LTE but LTE-Advanced, which Digicel hasn't even in Kingston fully. Even more incendiary was the "fastest data network" claim which is objectively inaccurate as according to Ookla. Heck, those stats were before FLOW turned on LTE Advanced. With FLOW now pumping speeds of near 400 Mbit/s on the downlink and up to 100 Mbit/s on the uplink, it makes my blood boil to think that Digicel won't do right by its customers and provide comparable uncompromised service. WHY does Digicel insist in hiding behind falsehoods to sell Jamaicans a service that's frankly DoA? Marketing plain and simple. Everything in the statement doesn't have to be true.